For a lot of people, 2017 was the year of the Battle Royale. Player Unknown’s Battlegrounds took the world by storm when it came out in early access on Steam. I was very tempted to pick it up, but then it was announced that there was going to be a console port at the tail end of the year, so I thought I’d wait. But then Epic jumped on the tailcoats of PUBG and released a new mode for their game Fortnite on console, much to the disgruntlement of the PUBG developers. Especially when it took Epic’s under performing game and breathed new life into it, changing what it was. I played a little Fortnite but couldn’t get into it really. The 1 vs. 100 gimmick didn’t do a lot for me and I found myself going back to more tried and tested waters for me, Like Overwatch, or Destiny 2. I probably will give PUBG a try when it comes to console. But in case you were wondering my thoughts on that whole genre/flavour of the month, there it is, and why it doesn’t make an appearance on my list. Spoilers, I guess. See! I still do use my PS4. Truth be told, despite it not being my console of preference, Sony has the much better exclusives at the moment on their platform. Cuphead is great and everything, but I can’t foresee Microsoft making a great single player, story driven game like this any time in the future, not like this. This is a great game. It came out awash a whole group of open world, exploration games and it still managed to stick its head out on top. 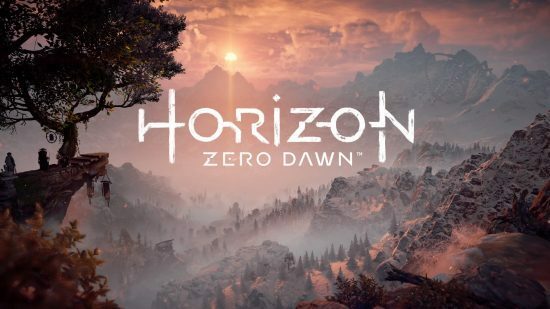 Horizon seems like a smarter game than your typical open world fare. I mean that the combat is actually a lot more involved than it might first appear. As the game starts, you can get away with rushing in and beating things with your stick. As you get deeper into the story and gain access to more equipment, you soon find that if you don’t approach a situation with a plan, you’re going to get trounced. Literally. A lot of the encounters require you to whittle enemies down, taking off chunks of their armour and hitting exposed weak spots with appropriate ammo types. Combat is designed to be way more ranged than you’d first expect. At no point does Aloy feels like an unstoppable badass, ripping robots apart without effort. But that isn’t to say you can’t still can’t feel badass when bringing down some of the larger enemies that were such a thorn in your side in the early game. The world is also a beautiful one, set in a “post-postapocalispe”, in the new civilisation that has emerged after the fall of society as we might know it in the near future. The world is a smattering of snowcapped mountains and frosty forests, mixed with hollowed out skyscrapers and twisted metal skeletons of a once bustling metropolis. All around the world being stalked by large advanced machine animals, all serving some strange unknown purpose. It’s gorgeous to look at and the mix of beautiful scenery with the expose musculature of the synthetic animals works in this really cool way. And their purpose might be my favourite thing about the game. 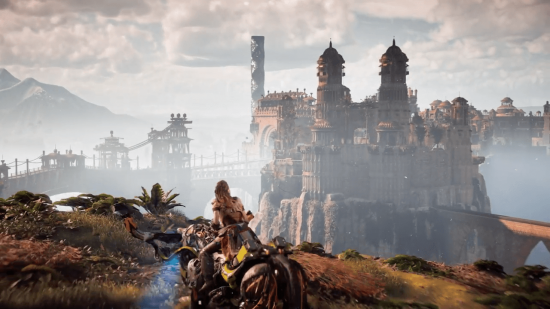 There is a whole lot of mystery and intrigue about what actually happened to the civilisation that came before, and Aloy has the unique ability to peer into the science of the past and slowly piece together what actually happened. Eventually learning what happened before and how Aloy fits into things is one of the most satisfying things about the game. It’s a really enthralling ride, and and the macabre nature of how humanity came to its end was really kind of chilling towards the end. We seem to have an obsession with the apocalypse in our science fiction these days and this is a real good example of it. It’s weird in that this is the type of game where I would really like it to be a one and done. It told a great story and ended it in a satisfying way. It’s disappointing that there is a bit of a crappy sequel bait after the credits, but I would be happy for this game to be a relic of a fantastic example of open world design. It’s a stunning thing and should be picked up by everyone with a PS4. Posted on December 26, 2017 December 26, 2017 by WooderonPosted in 2017, Best of Year:Tagged aloy, guerrilla games, horizon zero dawn, playstation 4, ps4, sony.